God Speaks To Me…And You, Too! “Do not come any closer,” God said. “Take off your sandals, for the place where you are standing is holy ground.” Then he said, “I am the God of your father, the God of Abraham, the God of Isaac and the God of Jacob.”At this, Moses hid his face, because he was afraid to look at God. My pastor talked with us last Sunday about God’s voice in our lives. He pointed out Moses’s story in the scriptures. Can you imagine? A bush that’s on fire, but doesn’t burn up? And then, the voice of God speaking to you from the bush? Honestly…I would have been halfway down the road, running as fast as I could before I even thought about why a voice would be speaking to me from a bush. And then I would’ve questioned my sanity for thinking that a bush was speaking to me. Just being honest here. Could it be that his soul responded to it’s Creator before his body responded? Before his “reasoning” told him this couldn’t be happening? Do bushes still burn today? Does the Voice still speak? Yes. A hundred times yes! It is my firm belief that God still speaks to His children today. He loves us. He wants to communicate with us. He has a word for me, for you! He is speaking. Are we still and quiet, so we can hear what He is saying? Because, while I don’t doubt at all that He could speak audibly through a burning bush or through any vehicle that He chooses, like He did with Moses, the Voice that I’ve experienced in my life has spoken to my soul. It hasn’t been a spoken, audible word, though it may have been for others. It’s been a whisper from my Savior to my heart. And, like my wonderful pastor said on Sunday, it’s been so crystal-clear, so powerful, that it’s the unmistakable voice of my God. I have to wonder if I’ve missed His voice at times because I wasn’t still enough. I wasn’t listening as intently as I should. During my prayer time, I tend to want to do a lot of the talking with God. Sometimes I have to remind myself to be still enough to listen for Him. And then He speaks, and my soul knows that I am on holy ground. His words are not something to take lightly. When I was five years old, I listened to my parents and my Sunday School teachers talk about a man named Jesus who died on the cross for my sinful heart. They told me that if I invited Him to live in my heart, He would clean out the sin and that I’d be His girl from then on. One night before going to bed, I heard Him. Ask Me to come in your heart. When I was a young teenager, I was so shy. I always loved to sing, but when it was time for me to sing at church or any event where people would be looking at me, I would get so nervous that I didn’t even want to do it. I started thinking that I couldn’t sing the way God called me to do. One day I was outside alone, swinging and singing in my “radio voice”, the one I used when no one was listening. I liked to listen to my favorite singers over and over and then imitate their voice inflections and styles when I was singing by myself. 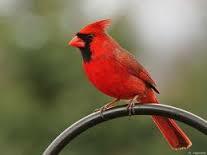 So here I was, singing away, when a little redbird came and landed on the swing beside me. I figured it would fly off, but it just sat there and watched me, and then whistled for a second and flew away. God spoke to me that day, more clearly and surely than any other voice in my life. I made the birds sing. I made you to sing. As an adult, I hear Him often, even in little parts of my day. Open the door for the lady. Sit down and hold your little boys. Talk to them. Listen to them. Tell the world Who I am. Write these words. Sing these words. I had the privilege this summer of hearing a wonderful writer and composer, Aaron Robinson, who wrote the book Does God Sing? In his book, he tells us that yes, indeed, God does sing. He sings through the sound of a newborn baby’s cries, through the song of a bird, through the sound of the wind whispering in the trees. He sings through the loving act of a friend. He sings to us because He loves us. And sometimes He uses us to sing for Him. He uses us to speak for Him. I am Yours, Lord. I have heard Your voice…telling Your love to me. The closer we are to the Lord, the easier it will be to hear His voice. This entry was posted in Devotionals and tagged Burning Bush, Christianity, church, creation, cross, faith, gifts, God speaks, hymns, Jesus, love, Moses, music, singing. Bookmark the permalink. 11 Responses to God Speaks To Me…And You, Too! Awesome – always blesses and encourages my heart! Thank you! In such a rushed, hurried society, with so much clamouring for our attention, it is often so hard to be still. Yet Paige, through all that clamouring, God’s voice often does break through as you described “the little parts of my day”. He really does speak to me. 🙂 Thank you for sharing this Paige. It is deeply appreciated. Thanks so much for your encouragement! Yes, He speaks! Sometimes there is so much static in my own corner of my soul I miss out on hearing his voice. Thank you for reminding me to listen for he is always there waiting patiently for me to say above the static, Here I am! Yes, I believe God still speaks to us and through us today too! Thank you for your beautiful post and the story about the bird that came to listen to you sing 🙂 I tried to comment earlier, but it wasn’t going through, so hopefully it will work this time. Thank you so much for your kind words Teresa! Moses’ soul responded before his body. Love that! I pray that my soul would too before my imperfect body!!!! !